Nike senior designer Tate Kuerbis must’ve packed his bags, whipped out his passport and hopped into a DeLorean while crafting his latest Jordan Brand creation. The new Air Jordan XXXIIs, which debuted on Tuesday in Turin, Italy, are the second coming of the legendary Italian-manufactured Air Jordans IIs that dropped more than 30 years ago during Michael Jordan’s third season in the NBA. Both pairs of shoes feature a similar structure, collar wings first seen in Jordan’s signature line on the IIs, and the iconic “Wings” logo on the tongue. “Our goal with the AJ XXXII was to combine the essence of the AJ II with today’s best innovation to create a distinct design language both on and off the court,” said David Creech, Jordan Brand’s vice president of Design. That new technology is incorporated into the Kuerbis-designed XXXIIs through a “first-of-its-kind Flyknit upper,” formed by high-tenacity yarn. What does that actually mean? In layman’s terms, the XXXIIs boast components that make them the most flexible Air Jordans in history. That means we should expect nothing less than for Jordan Brand athletes Russell Westbrook, Kawhi Leonard, Jimmy Butler and Carmelo Anthony to get busy on the court in the XXXIIs during the upcoming 2017-18 season. The question is, can they channel the same magic that His Airness delivered to the IIs, which he played in during the 1986-87 season. Here are the top three performances and moments that Michael Jordan had in the Air Jordan IIs — the sneakers that served as inspiration for the latest release on his signature Air Jordan line. Remember when Jordan soared through the air in his first career NBA Slam Dunk Contest in 1985, with his gold chains swinging and Air Jordan Is on his feet? There was also 1988, when he threw down a dunk from the free throw line while rocking his Air Jordan IIIs. But never forget: Jordan first won the dunk contest in 1987, while rocking the Air Jordan IIs. 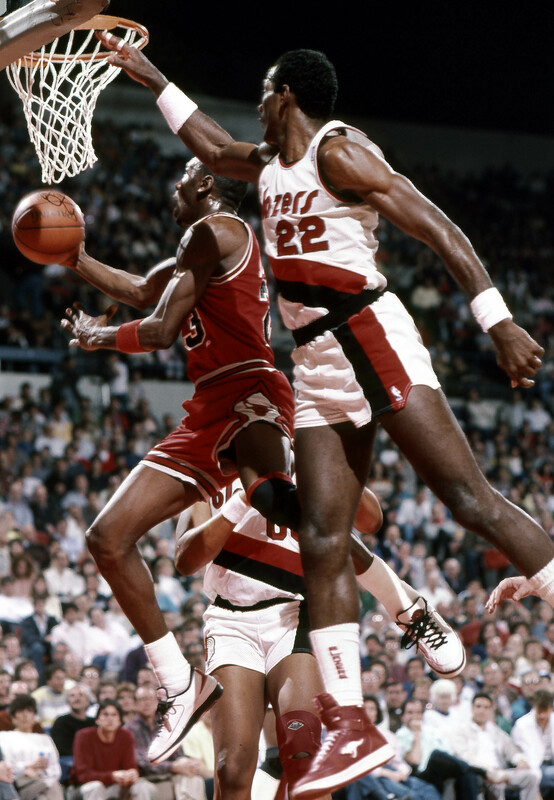 On his final dunk of the night, Jordan connected on an acrobatic, leaning windmill from the left side of the hoop that earned him 50 points and the win over Jerome Kersey of the Portland Trail Blazers. A day later, Jordan wore the IIs in the 1987 NBA All-Star Game. Michael Jordan lays the ball up past Portland Trailblazers guard Clyde Drexler at Memorial Coliseum in 1987. Jordan had the best scoring year of his life during the 1986-87 season, which he finished with a career-high average of 37.1 points a game and his first league scoring title. Two performances from that season especially stick out. First, on March 4, 1987, against the Detroit Pistons, Jordan scored 61 points, including 26 points in the fourth quarter that he capped off by draining a nearly impossible jumper to send the game into overtime. A month later, on April 16, 1987, Jordan put up 61 points again — while scoring 23 straight at one point in the game. The Bulls lost, but for Jordan, it was a record-setting night. He became the second player in NBA history, along with Wilt Chamberlain, to score 3,000 points in a season and the first player since Chamberlain to score 50 or more points in three consecutive games. Jordan was unstoppable in the IIs in both 61-point performances. Fun fact: The first player exclusives (PEs) Jordan ever received from Nike were a pair of Air Jordan IIs. After the 1986-87 NBA season, Jordan suited up for Dean Smith and his alma mater UNC in a charity alumni game against UCLA at Pauley Pavilion in Los Angeles. Jordan took the court in a pair of Carolina blue-accented IIs that were specially designed for him. Earlier this year, Jordan Brand paid tribute to the classic alumni game, and His Airness’ first pair of PEs, by releasing the same IIs that Jordan wore 30 years ago. The “Rosso Corsa” Air Jordan XXXIIs are scheduled to be released on Sept. 23 for the retail price of $185. The “Bred” Air Jordan XXXIIs, in both mid ($185) and low ($165) versions, will be released on Oct. 18.